Last Christmas, Emma got what she wanted most. She got a 5 year old boy. Emma’s first Christmas was spent in her crate away from the trampling feet of my rambunctious niece. She was less than a year old when the lights were strung and the ornaments were hung (high) on the tree. For everyone’s sake, she spent a quiet evening napping while the gifts were opened and dinner was served. She missed a full hour of my niece screaming "presents, presents, PRESENTS" while we waited helplessly for late arrivals. She missed a meal that took all day to prepare being shoveled down in 15 minutes so the PRESENTS could be opened. She missed the sink backing up and mama waving good-bye to the guests with a plunger in her hand. I can tell you this much - she got the better end of the deal. I was ready to climb into the crate with her by the end of the evening. Emma’s second Christmas held a new challenge. My sister, her husband, and my nephew made a pilgrimage north for the holidays. Now Emma seemed fine with kids. My neighbor’s grandson often chats with Emma when he comes to visit. He stands at the fence yelling EMMMMMAAAAAA (like Brando, but higher pitched) until she comes to the fence to be admired. She thinks he’s just dandy. Still, I was a bit concerned over the fact that she likes to play a bit rough. I pictured my nephew wailing as Emma pinned him to the ground - another insignificant male for her to toy with. 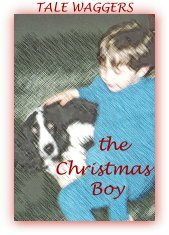 Would he suffer, as Arthur had, the brute force of an active young dog moving at high speed? Would this go down as one of those "Holidays from Hell" dogmama is famous for? We waited anxiously. The wonder of dogs is that you can never really understand how they think. Despite lounging about in a child-free zone all their lives, all my furkids have always been wonderful with children. And it came to pass that even Emma (Emma the Evil, Emma the Enforcer, Emma - The Bad Seed) somehow understood that the rules were different with the waist-high crowd. She was charmed - and charming - from the moment "her boy" arrived. They ran through the house playing chase and fetch and all the joyful games puppies and kids are meant for. She was gentle. She was mindful of his small size. We were pleasantly amazed. On Christmas morning, Emma’s boy passed out the dog treats - emptying the stockings into waiting mouths. Emma got a dandy stuffed pig with an obnoxious noise box inside. When clenched between her teeth, it made an outrageous impersonation of a real pig. She inspected it, then took it to her boy. He made it go. He made it fly. Life was good. Of course, kids will be kids. My nephew misbehaved and was sent from the table. Emma offered solace. The two of them sat shoulder to shoulder on the couch with the most mournful expressions. Then Emma got snippy with mama and was scolded. A tiny hand stroked her leg all the while. They had a magical connection. Her boy made all her toys come to life. Emma was a toy come to life for her boy. They played, they cuddled. The first thing Emma did each morning was check to make sure her boy was still there. But, a week goes by pretty quickly even for a dog and her boy. Like all her toys - the boy disappeared one day. Unlike her other toys, he left our house in one piece. Sometimes, I see Emma staring into space with a dreamy expression. I wonder if she’s off playing with her "Christmas Boy". 800 miles away, there’s a small picture of Emma in a frame - pasted there by her boy.